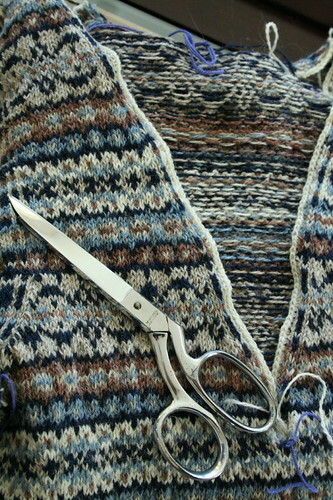 While I finished knitting the Ivy League Vest last weekend, it still has a million ends to weave in. I hope to finish it up this weekend so you’ll see pictures next week of the blocked version. In the meantime, remember how I was bemoaning the lack of easy, mindless, on-the-go projects? The real reason I never have fast, easy projects around is that since said projects are fast and easy, they fly off the needles! I’ve had two skeins of this sock yarn stewing in stash for a few years! I decided that I really shouldn’t dig into my nice sock yarn stash for a plain stockinette project so I paired these two together, for better or worse. I’m quite satisfied with the result! 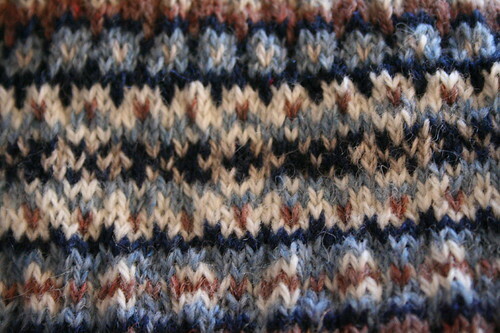 Initially, I followed Meg Swansen’s “jogless join” method (tutorial from sockknitters.com here) to keep the join clean. You can see the unimpressive results below. It’s not bad but I felt sure I could do better by carrying the unused yarn up the seam the way one might in a color work project. For my taste, that’s much better! There’s a bit of a jog but at least no bulky seam of loose stitches from the k2togs. 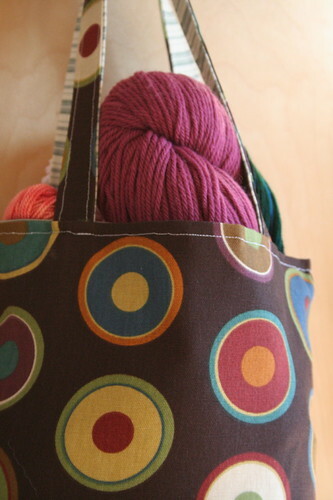 I couldn’t find a good tutorial for carrying the yarn up the seam – does anyone out there have one? If not, I’ll post one sometime soon. Do you ever have trouble finding an on-the-go project? A purse project? A mindless project? I struggle with this. 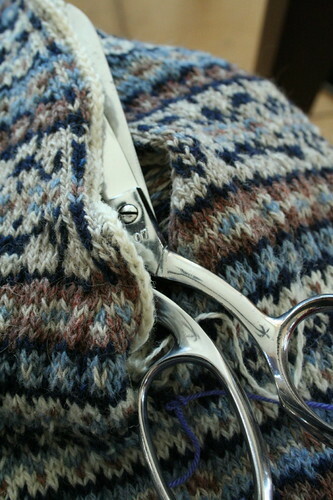 As far as I’m concerned, all projects start out as purse projects but then get too big, too complicated or too fiddly. While I would love to devote myself only to big, complicated projects, life intervenes. It seems that I’m rarely just knitting. I’m watching Beatrix, reading, studying, waiting at an office or sitting in the car and knitting. As a result, I have too many WIPs that have been cast aside because they require too much attention. Let me show you a few. 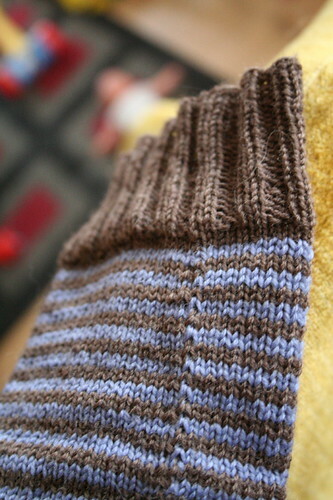 First up, the second Drunken Bee sock. 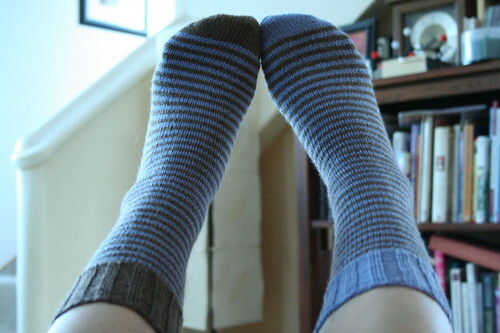 The first was so beautifully knit by Stella, who must think I’m such an idiot for not yet having finished a second sock. I have knit and reknit this one too many times. It’s a good thing I’ll only be knitting one! My mistake was to assume I could knit this on the go. Halfway down the leg, I still haven’t memorized the chart. 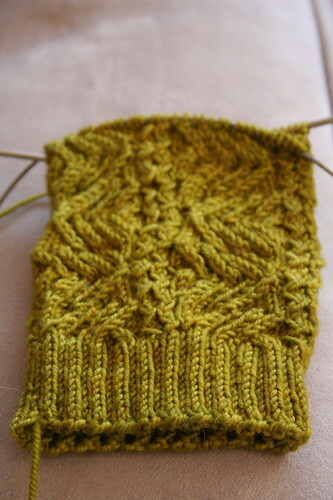 I cannot wait to turn the heel, if only for the reward of stockinette sole stitches! In spite of everything, it really is beautiful, isn’t it? It’s just the perfect pattern/yarn combination. That’s really what drives me to finish it! 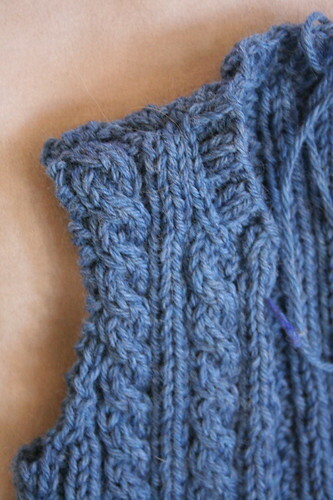 Next up, a cabled cardigan for Beatrix. I’m making this up as I go. I’ve finished the front and back but before I cast on for the sleeves, I have to track the kid down to measure her arms. It would appear that I forgot to do this when I planned the body. That means I also have to do some math to make sure the sleeve cap fits. Partly because I don’t want to knit the sleeves and partly because I think it looks adorable without them, I wish I had made this a vest instead of a cardigan. 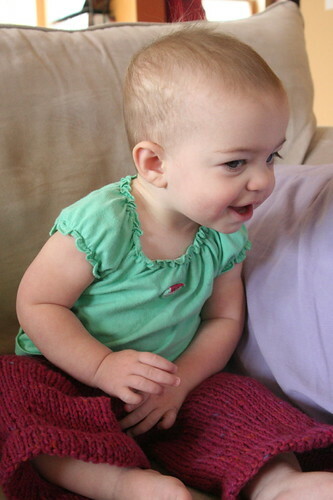 I will definitely be making a baby vest in the near future. 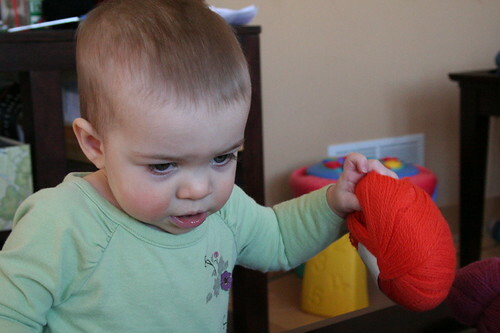 Besides, everyone knows toddlers hate sleeves, right? 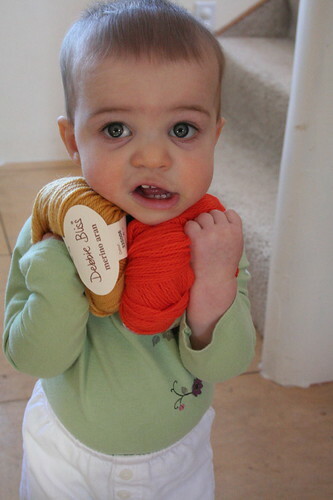 Speaking of baby knitting, I feel I ought to include some photos of a couple of unblogged projects: diaper soakers. *yawn* I know this doesn’t interest most of you – wool soakers certainly do not interest me but sadly, they are the most frequently used hand knit items in my house. 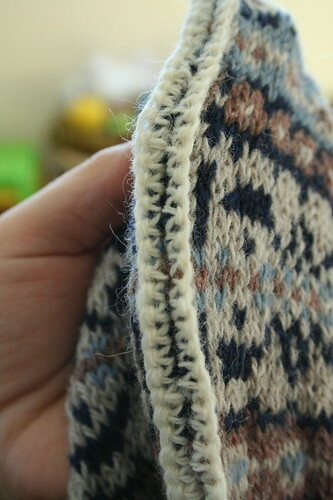 Skip to the end for pretty fair isle pictures! And now, the WIP that cannot pretend to be a purse project: my Ivy League Vest. 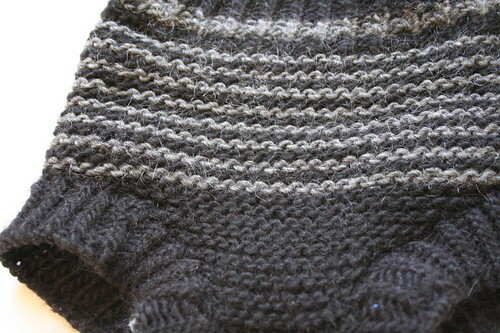 I started the ribbing on US 2s like the pattern suggests but it was way, way, way too small. 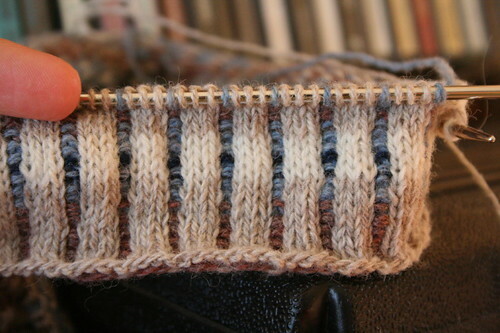 I wish I’d swatched the ribbing and not just the chart. I sought Glenna’s advice because she’s nearly done with her ILV. She said rip. I ripped. 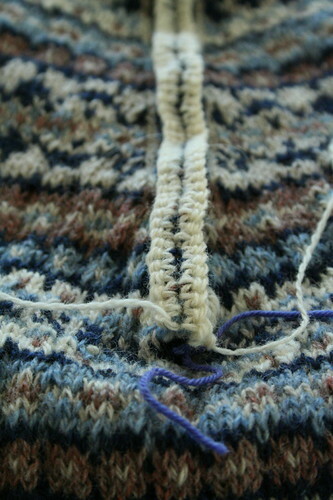 I started over on US 4s for the ribbing. 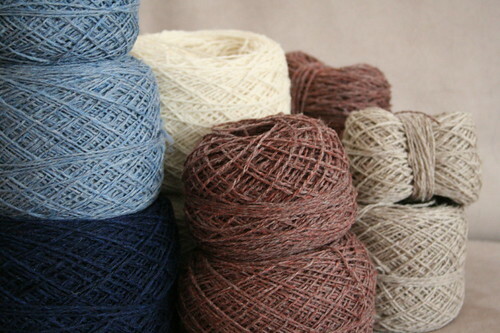 Yarn: Harrisville New England Shetland in Sandalwood, Oatmeal, White, Wedgwood, and Midnight Blue. I replaced Woodsmoke (teal) and Loden (dark green) with the light and dark blues. While I like the overall effect of the suggested colors, I dislike teal so much that I knew I would hate knitting the vest. I also cut out Pearl (gray) and decided to use extra Oatmeal to fill in for Pearl because I’m cheap and I didn’t think having one less color would much matter. 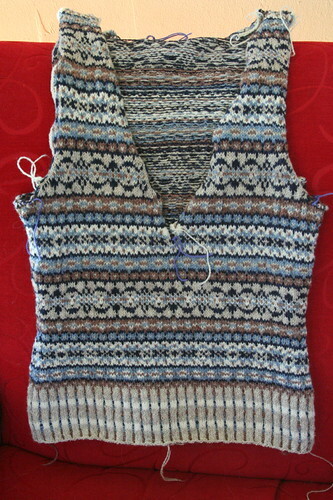 Knitting Daily did an interesting piece on how to fit this vest. It’s worth checking out if you’re interested in the project. I’m not entirely thrilled with how my waist decreases look with the purled faux seam stitch on either side but I think it will be alright. Yarn: 1 skein Brown Sheep Lamb’s Pride Worsted in Onyx and about 2.5 oz bluefaced leicester fleece? roving? I take pride in not knowing the difference. The end product is great. 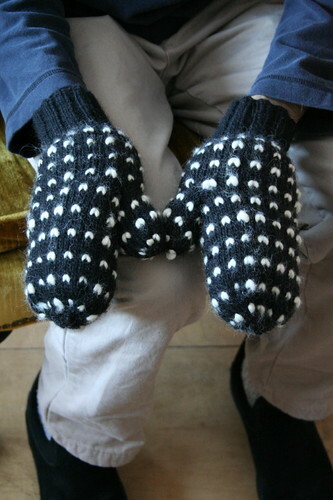 These will be the warmest mittens Aaron will ever have. The pattern is well written. Now, for the rest of it. 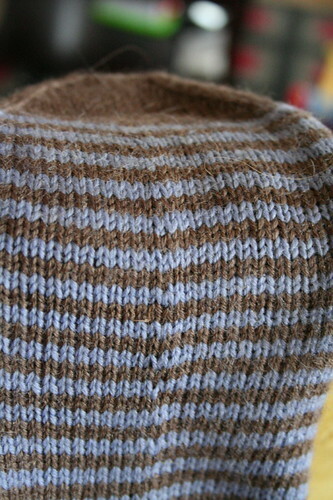 While this was an interesting (and stashbusting) project, the novelty soon wore off. I loathe Lamb’s Pride. I bought a few skeins of this as a relatively new knitter – before I knew better – and it’s just been stewing in stash for about 8 years. I hate that it’s a single ply, that it pills if you look at it funny, that it felts whether you’d like it or not, that it’s so very hairy. Its only redeeming quality is that it is no longer in my stash. 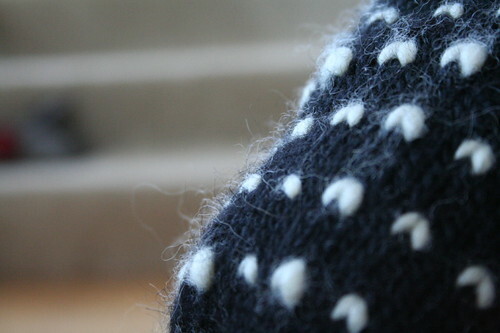 As for the thrums, I made 161 of them per mitten. In the process, I covered my living room in a fine layer of sheep fuzz. Realizing that my thrums looked remarkably like the clumps of undercoat that Petunia leaves all over our house, I decided to work in one, “personalized” Petunia thrum on the thumb. I couldn’t help it. The sad thing is that I probably should have just combed the dog out instead of buying fiber! I’ve been hoping to finish up some of my UFOs this week so that I can start on the Ivy League Vest from the Winter 07 Interweave Knits. I bought some Harrisville New England Shetland at my LYS last week, swapping blues for the teal and loden. Glenna has a nice one going and she’s inspired me to give it a try. You will have to look elsewhere for 2007 retrospectives and 2008 resolutions. You saw the projects, you know what I made this year. 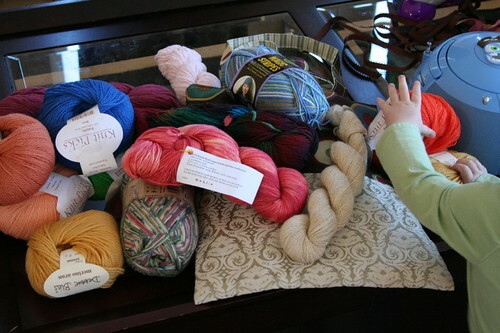 You also know that I will not likely knit exclusively from my stash for the next year so why pretend? I am looking forward to a new 2008 project gallery set in Flickr, the beginning of a new semester and an end to media hype about year-in-reviews (Talk of the Nation today? a complete waste of air time), resolutions and diets. I wish you all the best in 2008!